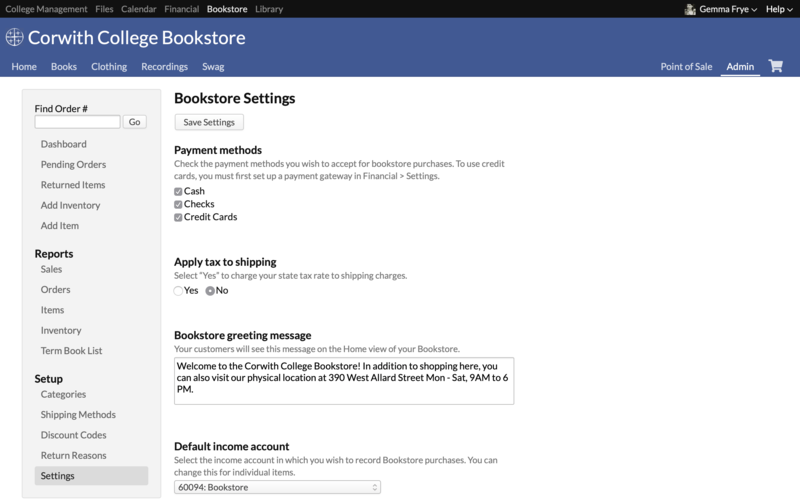 The Bookstore > Admin view includes reports about sales, orders, inventory, and related items. These items are available to Bookstore and Bookstore Admin users. Bookstore Admins have further access to various settings, including shipping methods, discount codes, and general Bookstore settings. Dashboard shows you recent sales, pending orders, and all-time best sellers. For more detail on your pending orders, click the order number, or check the pending orders report (see below). The amounts shown here are the subtotal; they do not include tax, shipping, or any discounts applied to the order. This report does not include orders fulfilled at the Point of Sale. This report gives you more detail than what's shown on the dashboard. Link to an order through the Order #. This table shows the orders starting with the most recent order placed, and breaks out the subtotal, shipping, and tax. Click an order # to see that order/receipt, or the customer name (if shown) to see their profile. This report lets you see which items have been returned and lets you do something about them. Read about processing returns in this article. Here you can add inventory to any existing item or segment in your Bookstore. Read about adding inventory in this article. This lets you add new items and segments for sale in your Bookstore. Read about adding new items in this article. The Sales report gives you a graph of items sold during the date range shown. Check Breakout to display the sales data by category (or subcategory). The Orders report shows all orders placed (pending, fulfilled, and voided) during the date range in the filter. Use the filter to focus the report on orders fitting certain criteria. Click an order # to see that order/receipt, or a customer's name (if shown) to see his profile. Click Export to create a spreadsheet of the report. Select order detail to include the individual items from each order. The Items report lists all existing items and current inventory information. (It does not list individual inventory segments.) The Inventory report lists inventory segments by SKU and provides a more granular look and what you have in stock at the moment. Use the filter to focus either report on particular items or segments. Click Export to create a spreadsheet of either report. The term book list shows all of the books assigned to your school's courses in a given term. It's meant to help you determine how many of which books you need to have on hand when school starts. Compare this report to your inventory report before ordering! The # columns indicate the number of students who may need a book. For what it's worth, those numbers indicate unique students. If two courses require the same book, the book list won't double-count students taking both courses. If you have a book listed in your Bookstore, click to see links to the item page(s). If a book does not exist among your items, click to add it as a new item. Guess what clicking the Export button will do? Hi, in the Term Book List there are actually four columns now after the ISBN, I assume #Opt. means the number of people who may need a book that is considered optional for the class?